Making Thinking Visible: Using Whiteboards in the Chemistry Classroom & Beyond | Gary G. Abud, Jr. This entry was posted in Education on August 1, 2011 by Gary G Abud Jr.
One of the most fascinating aspects of student learning is the way in which information is processed in a student’s mind. Teachers, and students alike, cannot fully appreciate how a student ascertains a set of given facts, a new concept, or solves a problem. This is because thinking takes place ‘behind the scenes’ in the human brain. When a student demonstrates that they have learned something, or comprehend an idea, it almost seems magical how the learning took place. It can be as if understanding suddenly appeared within a student. Some might call this an “ah-ha!” moment, but in reality understanding does not simply manifest out of thin air. Conceptual understanding, memorization of a string of facts, and recall of information for use in solving a problem are all demonstrations of student learning. Sometimes teachers, who are rushed by curriculum maps and other factors, focus on the ends (the learning) and not the means (how learning took place.) Although the learning is in itself important, the process by which learning takes place is far more important. Essential to improving teaching is an understanding of student learning; similarly, essential to student learning is an understanding of how students themselves perceive and process information. Critical to these understandings is an awareness of how students organize the information in their brain, connecting it through associations with other things they know (Levine, 2002). To reveal the thinking processes that take place in students’ brains when they learn or problem solve, thinking must be made visible to thinkers themselves and others as well. Students can develop understanding in their minds much more effectively if the thinking process that leads to understanding is elucidated for them. Teachers and students alike can support novice learners in developing their reasoning abilities by making expert thinking in a subject area visible (Collins, Brown, & Holum, 1991). Thinking can be made visible in a classroom in three ways: when teachers make their thinking visible to students; when students make their thinking visible to other students; and when students make their own thinking visible to themselves. Each of these modes of making thinking visible help students to develop expert strategies for thinking about subject area content and problem solving within a subject area. Not only will scaffolding students to expert thinking help them to attain conceptual understanding, but making thinking visible will enhance students’ critical thinking, metacognition and non-linguistic representations of ideas and processes (Marzano, 2004). In the chemistry classroom, where abstract concepts abound and algorithmic problem solving processes are ubiquitous, students must be scaffolded and coached to develop expert thinking; otherwise, students are left to their own devices to fend for themselves in attaining an understanding of chemistry. Scientific practice involves the construction, validation and application of scientific models, so science instruction should be designed to engage students in making and using models (Reif, 1995). When a teacher asks students to “show their work,” this is an attempt to peek ‘behind the scenes’ of student thinking. Showing work does not fully make thinking visible, because it is a one-directional pathway for showing thinking patterns; instead, creating an awareness of the strategies that students are using intuitively can help them call on these strategies more purposefully as well as develop these strategies and other metacognitive skills (Darling-Hammond, Low, Rossbach, & Nelson, 2003). Whiteboarding is simply a method of making thinking visible to students and between students. For years, teachers have used chalkboards, paper, dry-erase boards, and interactive whiteboards to make their own thinking visible to students, but rarely are students given a strategic way to make their own thinking visible with their classmates. 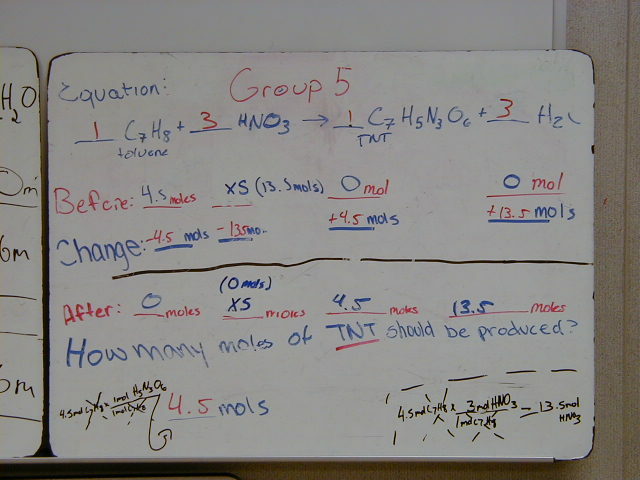 These whiteboarding techniques facilitate making thinking visible in the chemistry classroom. Description: Students or student groups form a large circle in which they stand and hold their boards facing the inside of the circle. Each student should be able to see all of the boards “meet” in the circle from where they stand; each student should be part of one continuous circle. Do not allow students to stand outside of the circle. The teacher stands outside of the circle. Key Features: Students can see all the information on all of the whiteboards easily and quickly; students are all on the “same level” by being in a single continuous circle; students are less likely to try to opt-out of discourse when standing in the circle. Description: The boards are positioned on easels, on a chalkboard ledge, or on top of a table/desk propped against a wall. All boards are displayed like artwork in a gallery. Groups walk around the room to view all the boards; groups draw conclusions or answer questions based on groups’ boards. One member of the group that created the board should remain near their board to answer questions. Key Features: Students can reflect on the content of a whiteboard one at a time; smaller number of students interacting with content at any given time; teacher can interview individual groups in front of a board, observe interactions between board creator and viewers, and teacher can address individuals’ understandings or group questions. Major Functions: View boards one at a time; teacher can perform formative assessment; teacher can remediate as needed or address students’ thinking; students can compare different problem solving strategies; students interact with their own group members and board creator. Description: The boards are laid on the floor adjacent to one another like pieces of a floor puzzle. Students sit in chairs in a single continuous circle around the boards. Students should be able to see all of the boards; but due to difference in board orientation relative to seat position, only some students will be able to easily read some boards. Students should not sit in front of their group’s board. Boards should be oriented so the bottom edge of the board is closest to the circle of chairs. Key Features: Like a board meeting, students are all on the same level as part of one large group discussion. Students have the individual responsibility of reporting the information contained on the board directly in front of them to the rest of the class. Major Functions: View all boards at once, compare data, generate non-linguistic representations, abstract relationships and patterns, or display problem solving strategies; students interact with entire class. Description: Class remains seated while one group at a time goes to the front of the class and shows/presents their board to the class and teacher. Groups hold boards or position them on easels. Simulates poster presentation session that would happen at a professional research conference. Whiteboarding is a versatile practice that can be incorporated into any classroom content to help show lines of reasoning or to illustrate students’ thoughts. The goal of whiteboarding, to depict student thinking, is reachable by other approaches as well. For the chemistry classroom many applications of whiteboarding exist including, showing problem solving steps, illustrating atomic and molecular structures, or interpreting experimental data to name just a few. Ultimately it is important, regardless of the methodology, for teachers to focus on the underlying goal of whiteboarding and create the opportunity to make thinking visible for students in the classroom. Darling-Hammond, L., Low, B., Rossbach, B., & Nelson, J. (2003). The learning classroom. S. Burlington, VT: Mort Crim Communications, Inc.
Levine, M. (2002). A mind at a time. New York: Simon & Schuster. Marzano, R. (2004). Classroom instruction that works: Research-based strategies for increasing student achievement. New Jersey: Prentice Hall. Reif, F. (1995). Understanding and teaching important scientific thought processes. Am. J. Phys. 63(1), 17-32. Wenning, C. (2005). Whiteboarding & Socratic dialogues: Questions & answers. J. Phys. Tchr. Educ. Online. 3(1), 3-10. Wenning, C. (2006). Engaging students in conducting Socratic dialogues: Suggestions for science teachers. J. Phys. Tchr. Educ. Online, 4(1), 10-13. Cool approach with the round robin in your post on argumentation. Thanks for sharing. Really liked the double-blind peer review format too! Pingback: Digital Journaling For Reflection | Gary G. Abud, Jr.
Pingback: Whiteboard Training Camp For Students | Gary G. Abud, Jr.